UPDATE: NASA has rescheduled this announcement for Thursday, Sept. 30, at 12 p.m. EDT. NASA will gather scientists together Wednesday (Sept. 29) to announce new findings about the edge of our solar system from a spacecraft gazing at the region from its orbit around Earth. The space agency will hold an afternoon teleconference to discuss the latest discoveries by its Interstellar Boundary Explorer spacecraft, which is studying the edge of the solar system from an orbit about 200,000 miles (322,000 km) above Earth. The teleconference takes place at 1 p.m. EDT (1700 GMT) and will be broadcast live on NASA's audio channel. Four researchers will participate, NASA officials said in a press announcement. The four are: Arik Posner, an IBEX program scientist in NASA's heliophysics division in Washington, D.C.; Nathan Schwadron, IBEX science operations lead and associate professor at the University of New Hampshire; David McComas, IBEX principal investigator and assistant vice president at Southwest Research Institute in San Antonio, Tex. ; and Merav Opher, an associate professor at George Mason University in Fairfax, Va.
NASA launched the coffee-table-sized IBEX probe in October 2008 to map out the boundary between the solar system and interstellar space. 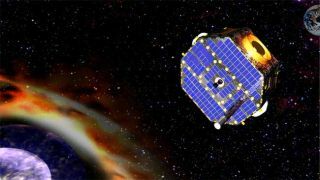 The $169 million IBEX spacecraft was built for an initial two-year mission. So far, IBEX has made some surprising discoveries. Last year, for example, the spacecraft detected a mysterious ribbon on the edge of the solar system that scientists now think is a reflection of the solar wind. And earlier this year, researchers announced that IBEX had gotten the first-ever look of the solar wind — the million-miles-per-hour stream of charged particles from the sun — crashing headlong into Earth's magnetosphere.